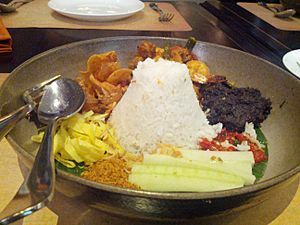 Nasi Lemak is a commonly found food in Brunei, Malaysia and Singapore. It is also an unofficial national food in Malaysia. It is traditionally wrapped up in banana leaves. The rice is usually cooked in coconut cream. Sometimes spices such as ginger are added for their aroma (good smell). Nasi lemak is sold in hawker centres in Singapore and other ingredients like fried egg, fried chicken wings and belacan chilli (made from chilli and shrimp) are added. Nasi lemak are traditionally wrapped in banana leaves. Nasi lemak Facts for Kids. Kiddle Encyclopedia.